Last week, UIC United Faculty greeted the newest members of our academic community. Our President, Janet Smith, spoke to new faculty at the campus orientation event about the history and ongoing importance of the union, and members from every college were present to personally welcome our new colleagues to the university. Meanwhile, at the annual Comp Camp for faculty teaching first year writing and composition, new faculty were eager to engage with our members about the work of the union. Between the two events, 25 new faculty became members on the spot! To continue the warm welcome, there will be a Back-to-School Picnic for UICUF members and their families this coming Sunday, 9/2. We will usher in the new school year with a fun-and-sun event, and hope our new colleagues can join us! And we haven’t forgotten the other new faces at the university. 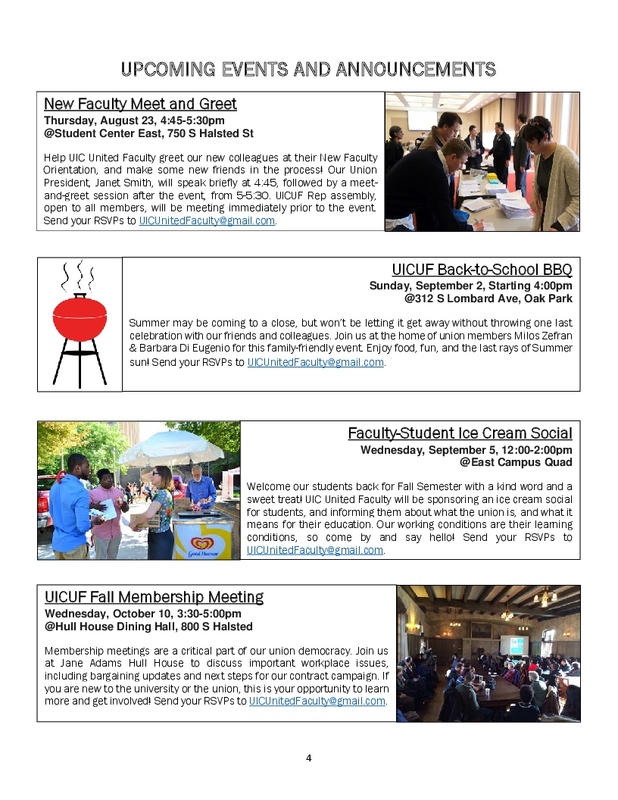 UICUF will be offering students free ice cream at the Student Involvement Fair in the East Campus Quad, along with info on the unions work, and how it affects their education. Our working environment is their learning environment. We strongly encourage UICUF members to come meet students at this fun event next Wednesday, 9/5. 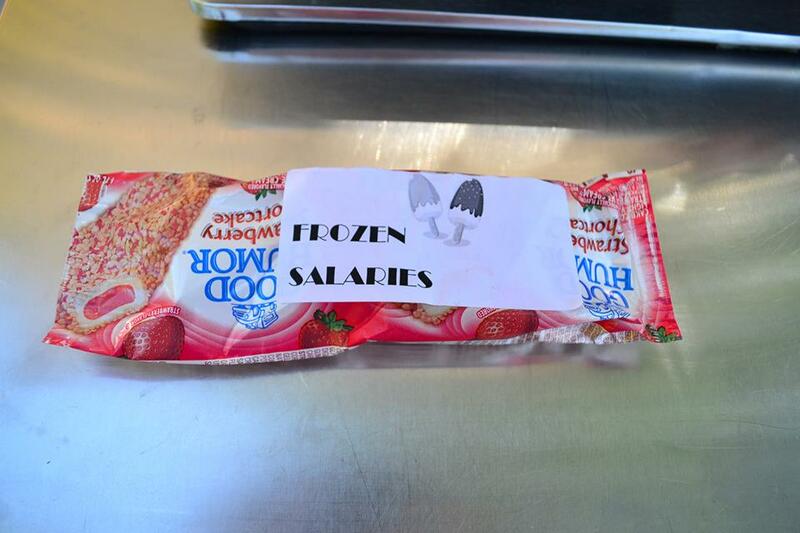 In contrast to the hand of friendship extended by the union to faculty as we begin the new semester, Labor Relations has chosen to freeze faculty out of this year’s campus wage program. They erroneously claim that they can’t give us our merit raises during contract bargaining, referencing labor law meant to protect the sanctity of those negotiations. What they don’t say is that it’s acceptable and common practice for groups engaged in contract negotiations to waive these “status quo” rules at times for the benefit of the employees. This is allowed, to ensure that employers can’t leverage the withholding of customary or universal perks, like yearly raises or bonuses, against organized employees negotiating a contract. UICUF has met directly with Labor Relations representatives no less than 6 times this summer, yet not once was it mentioned that the university planned to hold back distributions of merit raises to its faculty. The fact that this was not discussed with the union directly, despite ample opportunity, tells us all we need to know: withholding our earned merit increases is a strategy to build leverage against the union in negotiations. We fully anticipate that they will come back with this already insufficient 2% raise offer at the bargaining table later, hoping that our membership will be frustrated enough to just accept it. We will not, however, let this gross manipulation of status quo rules deter us for fighting to get the raises our members truly deserve. Looking beyond intention, to the ultimate substance of the salary program, the 2% salary program offered by President Killeen for 2018-2019 is an insult. It is in no way connected to the financial reality of living in Chicago, and is below the nearly 3% annual inflation expected this year. But this is not news for most faculty at UIC. Historically, this program has lagged behind inflation, and certainly below the expectations of what experienced professionals should be earning in an expensive urban area like Chicago. And it surely does not help faculty catch up after two years of flat wages from politically frozen budgets. Plain and simple Faculty at UIC deserve more! This all comes in the shadow of a half-billion dollar budget deal struck with Gov. Rauner to help build a highly questionable new campus in the Loop. Of course, just a few months ago, Rauner seemed to forget that the University of Illinois system already has a campus in Chicago (Audio clip at 3:45). When you look at the whole picture, it’s easy to see that Rauner, his appointees on the U of I board, and their representatives in Labor Relations don’t really care about UIC (when they remember we exist). That is why UICUF will be fighting for an investment in human capital this year, an investment that will ensure the recruitment and retention of the top-notch educators and researchers that our students and Chicagoans deserve. Our next contract bargaining session is Wednesday, September 12th. In the interim, we will continue to post weekly articles on topics of critical interest to our membership. For the duration of the bargaining process, we will be issuing periodic updates via email, facebook, twitter, and here on our website. We strongly encourage everyone to like and follow us on social media. With your support, we can make UIC an even better place to work and learn! 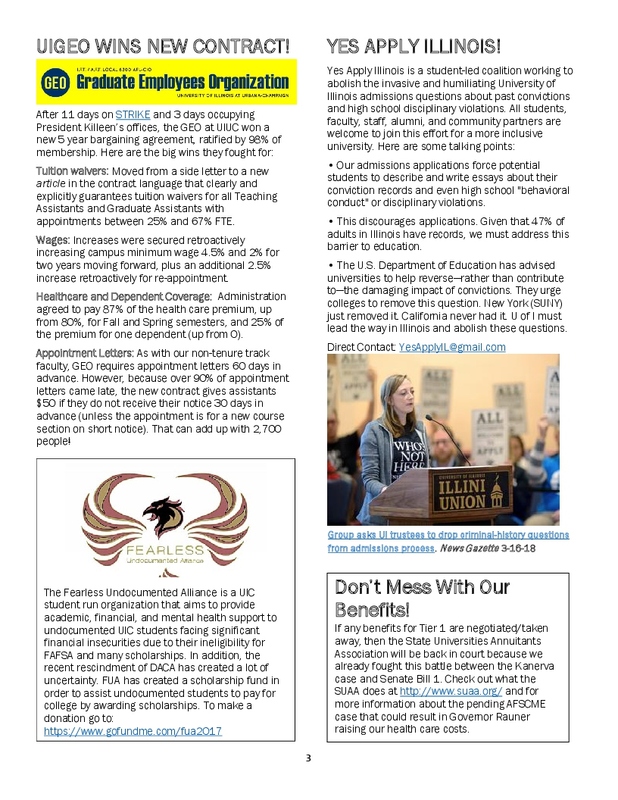 16 Aug UIC United Faculty Newsletter: 1st Issue! 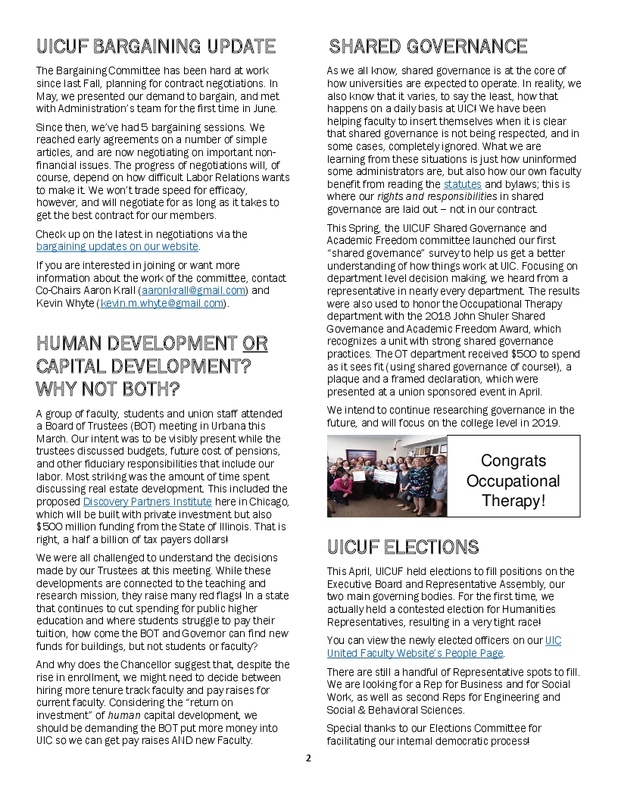 Today, we are excited to publish our first full newsletter, the UIC United Faculty VOICE! Learn about issues affecting our members, upcoming events, and new member benefits from our affiliates. You can also download a printable PDF version of the VOICE. Enjoy! We also want draw your attention to the our union’s Representative Assembly Meeting, and New Faculty Meet and Greet next Thursday. All members are encouraged to participate in our union democracy at our Rep Assembly in UH2028 at 3pm, and then join us in welcoming new faculty at the end of their orientation in Student Center East at 4:45pm. Lastly, bargaining updates will resume next week with our last negotiating session of the summer. Our previous contract has officially expired, but will remain fully in force until a new contract is agreed upon by both parties. If you have any concerns in this regard, contact us at UICUnitedFaculty@gmail.com. In the meantime, visit our facebook and twitter feeds for more content. On July 24th, UIC United Faculty, along with two dozen representatives from our fellow unions, GEO, SEIU and INA, visited the administration’s Labor Relations office. By that time, we had already spent several months trying to negotiate with LR on common-sense policy updates related to the Janus ruling. Particularly at stake was the timely and accurate inclusion of new members, and the exclusion of non-members on dues deduction. A month after the ruling, LR had not agreed to a mutually workable dues policy, and they appeared to be implementing their own policy changes without informing, much less consulting with, our unions. When our repeated efforts to have them disclose these policy changes were ignored, we felt we needed to take stronger action. That day, we walked into the LR offices to read our demands, and emailed the letter to the head of LR for good measure. It’s now clear that Labor Relations did get the message. We were somewhat surprised at how quickly our action elicited a response! We were also disappointed by the response we finally did get back from the Head of LR, which was blustery and riddled with inaccuracies. We conferred with our fellow unions, and together issued a level-headed follow up, asking for clarification on LR’s erroneous claims. So far, we have not heard back. In the spirit of openness, here are Labor Relations’ response on post Janus dues deduction and our union coalition’s follow-up to that response. So what *did* we get out of this excursion? Some answers, at least as to how Labor Relations views their responsibility toward campus unions and union members. It’s now very clear we will have to take further action vis-à-vis our own contract, and possibly through legal channels to ensure the protection of our membership. Indeed, it seems clear from their response that LR is inviting such action. While the effort to protect our members’ paychecks from petty Labor Relations games will doubtless continue, we consider this a definitive step toward a positive resolution. Our next contract bargaining session is Wednesday, August 23rd. In the interim, we will continue to post weekly articles on topics of critical interest to our membership. Look out next week for an overview of student evaluations, how they’re used here at UIC and elsewhere, and the best practices we hope to win for our university in the future. 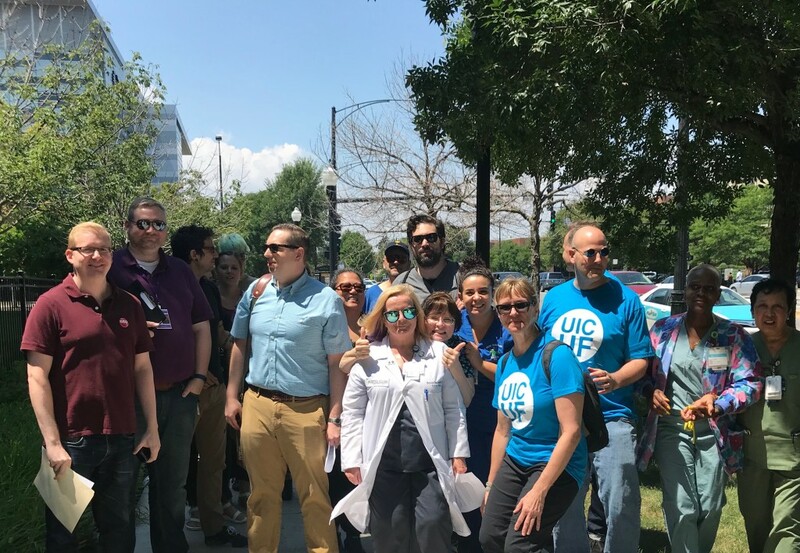 Yesterday, the UIC United Faculty joined with the Graduate Employees Organization, Illinois Nurses Association, and SEIU Local 73 to tell the UIC administration that we will not accept any further bureaucratic dithering or intransigence where union membership is concerned. On June 27th, the US Supreme Court issued a ruling in Janus v. AFSCME, which stripped unions of the right to collect fair share fees. Anticipating this, UICUF and a number of other campus unions had been working with UIC administration to make sure the transition would roll out smoothly when it came. We were assured by the administration that dues deductions would cease for non-members, and continue for members. We were assured the process would be seamless and accurate. However, after the ruling, the administration was non-responsive and unwilling to meet with us. Representatives of UIC Payroll, Human Resources and Labor Relations systematically ignored our efforts to confirm accuracy of membership lists prior to the July payroll deadline. Since then, administrators from these offices have insisted that there is no need to meet and discuss this topic. Given that in the last payroll, UIC failed to deduct dues for over a hundred of our members without notice, we very strongly disagree. We have been ignored, told nothing has changed, told changes can’t be made in a timely manner, told that they will happily drop our members outside the bounds of our contracts, and told that our contracts have not been violated. 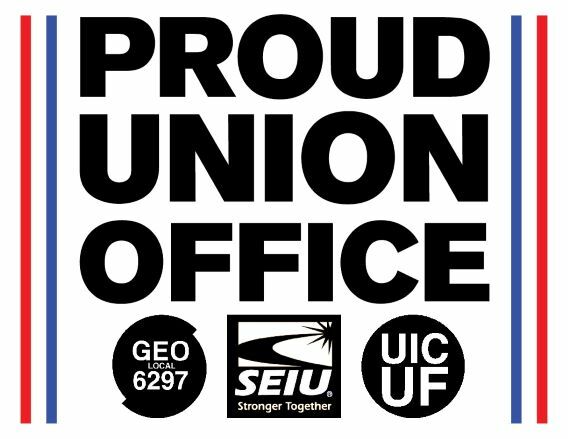 So yesterday, dozens of UIC union members and leadership gathered at the Human Resources office tell them a few things. Naturally, they sent a visibly flustered, completely new and unknown Labor Relations representative to deal with us, while the head of LR was “not in the office,” even though he was seen moments after we left. Unperturbed, we read our demands with a promise to return if our concerns are not addressed immediately. Below is our open letter to the UIC Administration. We hope they will respond with clear answers and real solutions. We are, however, prepared should they choose to continue to obfuscate and obstruct. 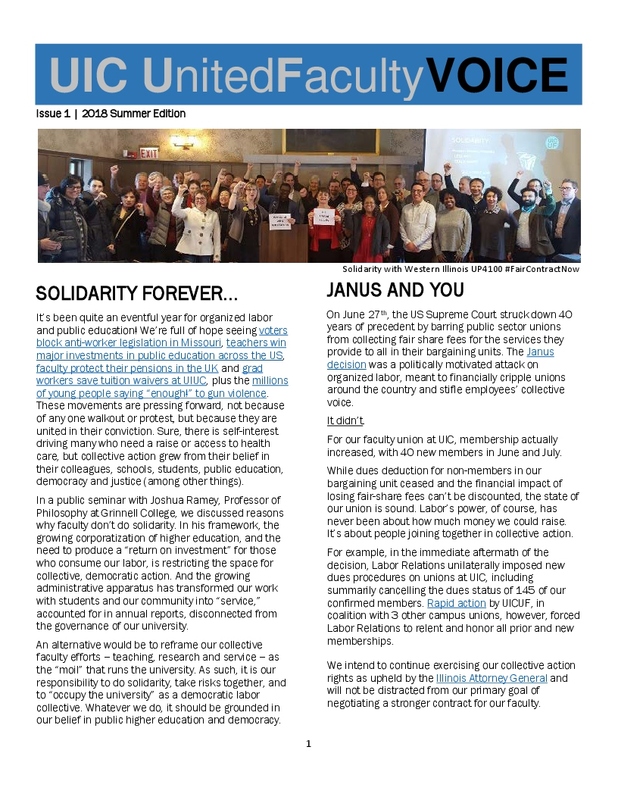 In light of the June 27 Supreme Court ruling in Janus v. AFSCME, and in response to the University’s attempts to unilaterally impose a new system for payroll deductions and revocations without consultation from the campus unions and in violation of the collective bargaining agreements, the Illinois Nurses Association, SEIU Local 73, United Faculty, and Graduate Employees Organization are demanding the following. We expect a response from you by Tuesday, July 31, 2018. The University will stop stealing money from the Unions by immediately correcting payroll codings by the next pay period. The University will compensate the Unions the amount of money it failed and refused to deduct in the last two pay periods. The University will cease and desist from improperly honoring revocation requests made directly to the Employer. Union membership is between the member and the Union. The University will not cease to deduct and remit payroll deductions from a Union member unless directed to do so by the Union. If the University is in possession of a signed Union membership card for a member of the bargaining unit at least 7 business days before a paycheck, the University will deduct dues from that member’s paycheck and remit them to the Union. When the Union submits new membership cards to the University, within 2 business days, the University will confirm receipt of the cards to the Union and will confirm that the cards will be properly processed to facilitate payroll deductions. When the University fails to process payroll deductions from a member of the bargaining unit with a signed Union membership card on file, it will notify the Union upon discovery of the error and will, upon the Union’s request, process double the normal amount of payroll deductions in the next paycheck. To ensure proper payroll deductions, the University will provide the most up-to-date bargaining unit list, in Excel spreadsheet format, to the Union upon request. If these demands are not met, the unions reserve our rights to pursue any and all remedies available to us under our respective collective bargaining agreements, state, and/or federal law. Happy 4th (and 5th) of July from UIC’s United Faculty! Many of you will have been out celebrating Independence Day with your friends and family yesterday, enjoying a well deserved holiday. We also want to remind you that today, the 5th of July, marks the 83rd anniversary of the National Labor Relations Act, which gave workers the *legal* right to form unions, bargain and strike. This didn’t just happen because the powers that be were feeling generous after their patriotic revelries that day. 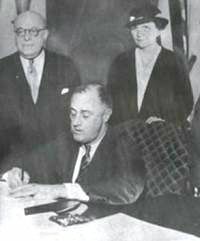 Workers across the nation, and the organizations representing their interests, fought hard in their workplaces, in the streets, and in the halls of power, to bring this bill to FDR’s desk, and have him sign it. Last week, the US Supreme Court made another historic decision, this time, stripping unions of the right to collect a fair share of fees from all workers benefiting directly from the services and representation their unions provide. This means that today, if you wish to have a strong union, a representative voice in contract negotiations, and a credible defender of your rights in the workplace, you have to make a proactive decision. While we don’t agree with the outcome of the Janus decision last week, we can all agree on this: with or without fair share fees, our union’s true strength is our willingness to stand together and ACT together for our shared interests. Fortunately, a week out from what was meant to be an historic blow to unions across the nation, we can say that our union remains strong. We’ve just begun bargaining a new contract, and our office has, in fact, been overwhelmed with both new membership applications, and current members reaffirming their solidarity with their colleagues. You can add your voice to this chorus of faculty saying “I’m sticking with my union” by becoming a member today. Eligible UIC faculty (both Tenure Track and Non Tenure Track), contact us at UICUnitedFaculty@gmail.com to learn more and join our union! As a reminder, our next bargaining session is next week, July 11th. BE IT FURTHER RESOLVED THAT: We encourage all supporting organizations and groups join in the state-wide TEACH OUT for Illinois Higher Education. IT IS RESOLVED, that the Department of English will be awarded the 2016-2017 UIC United Faculty John Shuler Award for Shared Governance and Academic Freedom. UICUF’s John Shuler Award for Shared Governance and Academic Freedom will be an annual award to a department or college that demonstrates its commitment, through action, to truly democratic shared governance and academic freedom. The union sees the Shuler award as a way to sustain our memory of John and to continue the work he had planned for his future, encouraging our faculty to pursue these goals in his spirit and his honor. John Shuler was a beloved member of the UICUF community. Doggedly involved with the union from its beginning, he was a tireless member of our bargaining committee and, at the time of his untimely death in 2016, served as treasurer. He was also energetically involved with the UIC Senate. For 23 years, John was a mainstay at the UIC library, responsible for government information/documents. UIC United Faculty endorses and will participate in the Chicago March for Science, a sister march to the Washington, DC, March for Science, planned for April 22, 2017. The organizing/steering committee of the DC March for Science includes an anthropologist, a physiologist, a health educator, a neuroscientist, an ethnobotanists/indigenous scientist, a science communicator, a pharmacologist, an engineer, and a philosopher of science. Science is essential for the health of our communities, the safety of our environment, the future of our planet. Science values diversity; diversity enriches sciences. Science is an international pursuit. Science needs to be open and independent. Adopted by the UICUF Representative Assembly March 1, 2017. As you may recall about a year ago we sent a request to President Killeen regarding our concerns about future increases to the cost of our health care. As a result of our advocacy and working in coalition with the UIC Senate, Academic Professional Advisory Council, and Staff Advisory Council leaders, the President formed a taskforce. After doing research and holding three town hall meetings, a report was produced and recently shared with leadership at all three campuses. We will be discussing the options outlined in the report and what strategies we might pursue moving forward at our next full membership meeting, March 8, 3:00-5:00pm at Student Center East. In the meantime, I encourage you to attend the APAC “Budget Outlook” Town Hall, February 9th, 2:00 – 4:00 PM, Thompson Room, Student Center West, 828 West Wolcott Avenue. Also, we informed you in an email January 24th that the Illinois Senate was working on a Budget Grand Bargain, which included cuts to our pension and a smaller budget for higher education. As of today, the 13 bill package has still not come to a vote. However, it may happen this week, so if you have not yet called your state senator to voice your opinion about this, this is the week to do so. With the support of IFT staff in Springfield and AFT staff in Washington DC, we are watching with a keen eye all legislation that is being considered and the positions of our elected officials. These are certainly interesting times – all the more reason we need a strong union. If you have any questions or concerns, please email me or your representative. 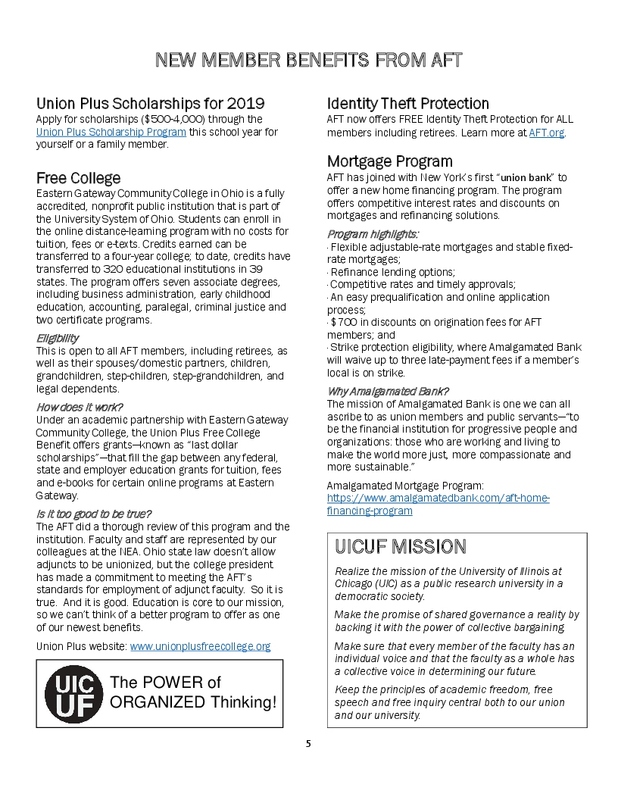 You can find contact information on the UICUF website, http://uicunitedfaculty.org/. Click the link below to Read UICUF’s letter to Chancellor Amiridis regarding the University’s troubling decision to pull back 125 million in indirect cost return (ICR) funds to cover the State’s potential budgetary shortfall.